Milwaukee's High-Tension Hacksaw may not have an "M18" in the name, but it offers features and performance that clearly make it a professional level option. The Milwaukee High-Tension Hacksaw immediately took me back to my youth. Growing up, fighting to get solid tension on my Grandfather’s old hacksaw was an exercise in frustration. I’d screw down that $%&#@! wingnut as much as my unprotected 12 year old hands could muster to try and get as tight a blade as I could. Of course I’d make through just a couple of cuts and be back to square one. I wonder how many times my Dad watched me fight with that thing and have to hold back the laughter. Users consistently point to two needs when it comes to a hacksaw – durability and tension. Those were at the root of my problems. 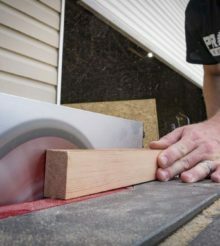 While the old saw had lived a good long life in our garage, the frame was too weak to deliver the kind of tension pros now know they can demand from their hacksaws. The Milwaukee High-Tension Hacksaw is designed around those needs with a couple of bonus features that users look for in a professional level hacksaw. The Milwaukee High-Tension Hacksaw joins other well-known brands in their effort to create a saw that will meet the demands of professional users. Milwaukee isn’t a “I can make one of those, too” companies. You won’t see them tackle a product without invoking disruptive innovation in the process. Milwaukee targets durability and tension in a model that they claim offers up to four times greater tension and five times the durability of other leading hacksaws on the market. Those claims are going to be tough to quantify, but I’m going to give it a chance to alleviate any doubts I have. Aside from those claims, the Milwaukee High-Tension Hacksaw also includes storage space in the top of the frame for six additional blades. The blades are held in place with a simple bolt in the side. I was able to work with it just being hand tightened, but you may want to use a screwdriver to get it more secure for transport. Making flush cuts should be easier with a 45 degree angle position. Changing the blade position is simple – just unscrew the tension control and lift the blade from the knobs. These are tilted in the opposite direction of the tension to secure the blade in place. The simple design also makes blade and position changes super easy. A tension adjustment knob on the top of the frame is used to, well, adjust the tension. This is opposite placement as traditional thinking puts the lever on the bottom, allowing the frame on the handle side to be pulled closer to the handle for increased tension. Looking at the top-oriented design, the adjustment knob uses a nut to pull a bolt up that in turn pulls the handle side of the blade closer to your hand. This design moves the pivot point on the frame from the top to the middle. Presumably, by shortening the lever length to the pivot point, we find the source of Milwaukee’s increased tension strength – at least in part. Longer levers use strength more efficiently when moving an object. In this case, a longer lever works against the durability of the saw as tension is increased between the blade attachment point and the pivot point. Milwaukee’s design should place less strain on the pivot point than other designs, leading to greater tension and reducing the likelihood of failure. The rigid, all-metal frame helps hold the high-tension without the buckling issues that would have been common in older designs. The only place I didn’t find metal was around the handle where a rubber overmold is present. It seems to be a bit harder blend than what is used on Milwaukee’s cordless tools. I found the grip design to be just fine for working though. Underneath the overmold, the metal frame is still present. The Milwaukee High-Tension Hacksaw is paired with a 24 TPI blade appropriate for PVC and metal up to 3/8″. I don’t think I want to cut 3/8″ metal pipe with a hand saw, but it’s good to know I could if I really wanted to. Ergonomically, the saw is sound with or without gloves on. I made several cuts through some copper piping that had outlived its usefulness. There was really nothing about the saw I had to think about – no tension release during the cuts and no hand fatigue from being forced to use an iron grip. It did take a little getting used to cutting at a 45 degree angle on my first flush cut. Admittedly, I thought about turning to our M12 Fuel Hackzall. With a little practice though, muscle memory sets in and it becomes second nature. Milwaukee did a great job with the design of their High-Tension Hacksaw. As I look over the design, my only real complaint is that it’s powered by a K18 Fuel Arm instead of an M18 Fuel battery pack. Ergonomics are solid, there’s plenty of strength for high-tension, and the build quality looks to stand up to anything you can throw at it. Even the price point is competitive. With an expected retail price around $20, the Milwaukee high-tension Hacksaw comes in lower than the other brand names sharing a similar design which should mean we’ll see these flying off the shelves as they come in. Shop all Milwaukee products at Acme Tools!